Peyton Bear has loved learning since she was a young girl. Whether it is in an academic environment, or learning the skills taught through athletics or community involvement, her learning is continuous. Always striving to better herself, Peyton joined HSC in Grade 7 after seeing the opportunities that her brother was exposed to that her previous school wasn’t providing her with. Upon her arrival, Peyton made a point of joining as many groups and clubs as possible so that she could take advantage of the full HSC experience. Her continued involvement helped her feel as though she was part of a big family, and helped her to feel at home at her new school. As part of this involvement, she joined the Community Committee, volunteered as a Montessori and Junior School Mentor, and became a reading buddy at Adelaide Hoodless School. While passionate about academics and school involvement, Peyton has a love for sports that began when she was young. She started playing Rep hockey when she was seven years old and enjoyed being part of a team that offered her the ability to learn many life lessons such as hard work, effort, enthusiasium, and teamwork. Upon attending HSC Peyton joined the Senior Girls Hockey team (as their youngest skater) and then added the U14 Basketball, Girls Soccer, and Flag Rugby teams to her list of activities. She proved that hard work pays off as she was named as the most improved player for both basketball and soccer. Outside of academics, clubs, and athletics Peyton has become more involved within the HSC community by helping out in the Junior and Montessori Schools. She is also a member of the World Issues Committee, the Math Olympiads, Concert Band, is in the Writer’s in Residence program and is a House Captain. “Being a House Captain has been an amazing leadership experience so far. I love that I can have an impact on the younger girls in my house and be a positive influence for them,” she says. Nicky Grigg walked through the doors to HSC in Grade 7 and upon his arrival he quickly became involved in the HSC community through volunteering and co-curricular opportunities. Academics were one of Nicky’s strengths even prior to attending HSC. While attending schools in Thailand, Vietnam and Singapore, Nicky excelled academically, completing standardized testing and achieving results in the 91stpercentile in language, 94thin reading, and 99thin math. Those skills have been finessed throughout his HSC education and in Grade 7 he achieved honour status, and in Grade 8 he was part of HSC’s Grade 8 Math Enrichment program. With his strong desire to learn more about the world we live in, Nicky was chosen to go to rural Indonesia to help teach English, an experience that allowed him to be of service. 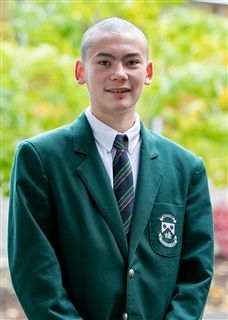 Continually striving to make a difference, he also participated in a 28 kilometre walk to raise money for women in Africa, and was selected to attend We Day with HSC. In addition to volunteering and striving for academic excellence, Nicky keeps busy by participating in a variety of after school activities. He began playing soccer and made the U13 and U14 soccer teams at HSC, receiving the most improved player award during his time with the U13 team. Always looking for something new to learn, he has also participated in ultimate Frisbee, Robotics, stage crew, the digital media club, as well as a coding club and a drama club. Kaitlyn Treleaven joined HSC in Grade 6 and quickly took advantage of the opportunities HSC had to offer. She was provided with early leadership positions which she eagerly embraced. Throughout her time in Middle School she performed well academically and was honoured to receive the Nina Devillers Award for all around achievement in Grade 6. She also won the highest General Proficiency Award in both Grades 7 and 8. Kaitlyn is passionate about sports and is drawn to team based activities. She has been a member of the soccer, volleyball, flag- rugby, track and field and cross country teams. 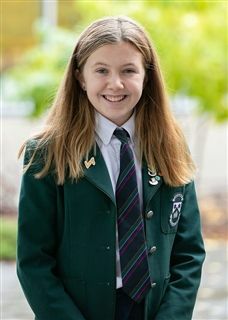 In Grade 8, she was an Yre House Captain and enjoyed making connections with the younger students and faculty. She participated in house games and volunteered at College-wide events. Outside of school, she plays rep soccer, participates in adventure running and enjoys spending time with her family. She works hard to balance her time between these commitments. 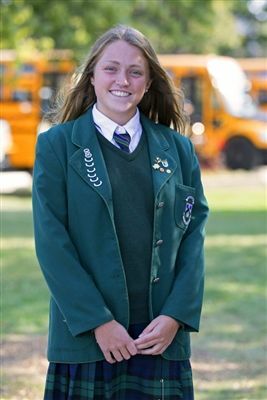 Currently in the Senior School, Kaitlyn has joined the cross country and CAIS soccer teams. She has applied to be an ambassador, takes enriched courses, is excited to be taking part in exchange to France and looks forward to getting involved with many other College events and opportunities. Throughout his time in both the Junior and Middle Schools at HSC, Myles McArthur has excelled academically, proved himself as an accomplished athlete and musician and held many leadership roles. In Middle School, he captained the rugby, soccer and basketball teams to several consecutive CISSA Championships culminating with the U13 CAIS National Soccer and Basketball Championships. As House Captain, he led Pine House to win the coveted Gibson Shield. 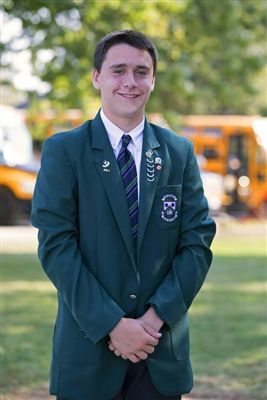 Throughout his Middle School years, he won many academic, music and athletic leadership awards including the Lucas Junior Sports Award in Grades 7 and 8. Myles has maintained a high academic standing and is proud to represent HSC in math competitions such as the Math Olympics. As an HSC Ambassador, he enjoys the opportunity to promote HSC within the community. Also, he has been an active participant of the Middle School concert and jazz bands and enjoys playing the saxophone and piano. Outside of school, Myles is busy playing competitive soccer and provincial basketball.